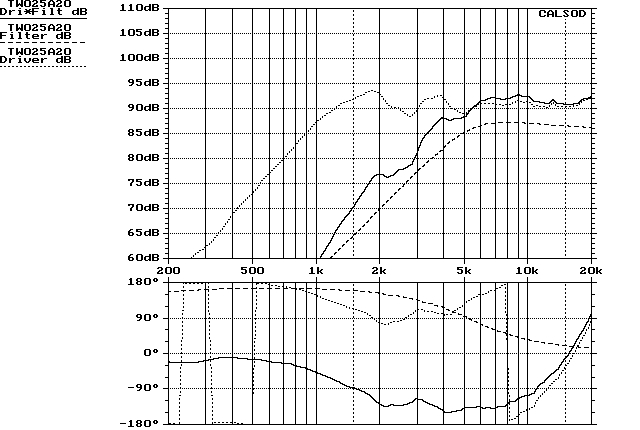 It is now the turn of the high frequency (HF) acoustic branch to be studied and controlled in terms of SPL response. The associated highpass filter HPF will be treated in the same way as the LPF. We continue the example we used in the previous article. We use the same topology. The dashed gain response of our highpass filter shows a mild resonance ie. a frequency range with positive values. We must recall that whatever is over the 86dB(=0db for filter gain) reference level in this plots is regarded as positive and vice versa. Such a 'resonance' is usually not a good thing to have in crossover filters because the transient response of those filters to input oscillations (of such frequencies) tends to be uncontrolled and time-smeared : Output oscillations will last far more than input. Usually these resonances disappear when series resistor increases or capacitance/inductance changes. 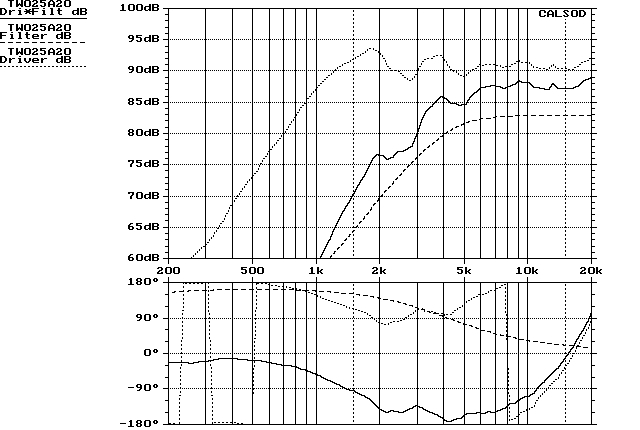 The other thing to watch out is the -6dB frequency of the acoustic branch SPL response. As a rule we expect the SPL responses of both branches to intersect at their respective -6dB frequency points and sum up to an almost flat overall response. We say that we want acoustic branches to 'cross' each other at their -6dB points and 'add' forming a flat 'total' response. The overall process is approximate and that is why it is a golden rule of thumb to start with before making fine adjustments of component values. The new HF passband level is somewhere around 87-88 dB ie. 1dB more than what we want. We can let it be. Some designers prefer this small treble boost (1-2dB) because it makes their speaker projects sound 'live' provided that the listening room won't be too much reflective. In that case the average listener will not like it at all! The HF branch response despite its peaks passes through the 81dB SPL point at 2000 Hz approximately. Now we are ready to attempt a summation of both acoustic branches.